The slime mould Physarum polycephalum is a single-celled organism without an obvious nervous system. Nevertheless, it has recently been shown to use an external spatial memory to navigate. When it explores an environment, it leaves behind a trail of extracellular slime, which if it encounters later, it strongly avoids. This response ensures that the organism does not revisit areas that it has already investigated. The avoidance behaviour is also a choice because when no previously unexplored territory is available, the slime mould no longer avoids the slime. In essence then it possesses an externalised memory, which because it relies on feedback from chemicals, maybe a precursor to our own. I have developed a novel process that selectively reveals the slime mould’s external memory as it explores its environment. The blue-grey threads are the living organism itself which now occupies the routes where exploration resulted in success, that is, it found food sources. 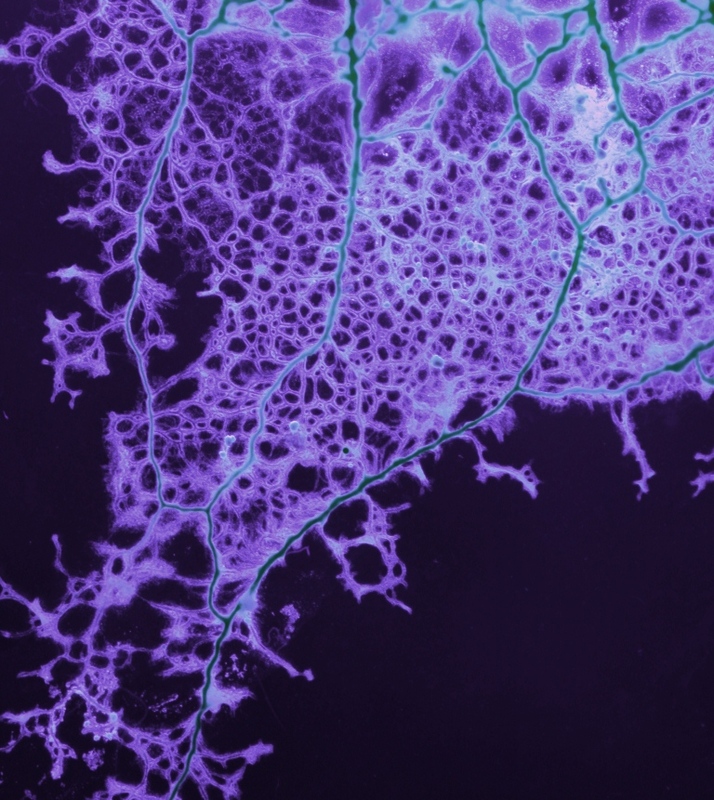 Remarkably, this “success” is surrounded by a matrix of failed possibility (the purple trails), that is the paths that the slime mould explored but that were never successful but which are still revealed by the unique process. This entry was posted in Uncategorized and tagged BioArt, Physarum. Memory, Slime Mould by simonsublime. Bookmark the permalink. Hello! I’m currently working with P. polycephalum and I’d love to make it glow! What kind of fluorescent particles do you use? I don’t want to poison mine! I use a fluorescent hand hygiene training kit called Glitterbug. This doesn’t make the slime mould itself glow though as it seems to actually absorb UV irradiation. It does light up the slime trails though, and so is a good reporter of where the slime mold has travelled.